In the small town of Vyksa, about 200 kilometers east of Moscow, was the third edition of International Art Ovrag Festival. The graffiti filled the streets, creating a reall museum in the open air. The organizers of the Vyksa festival believe that "illegality" as a basic feature of street art has practically exhausted itself: graffiti is gradually becoming "normal" art, where taboo is giving way to content. 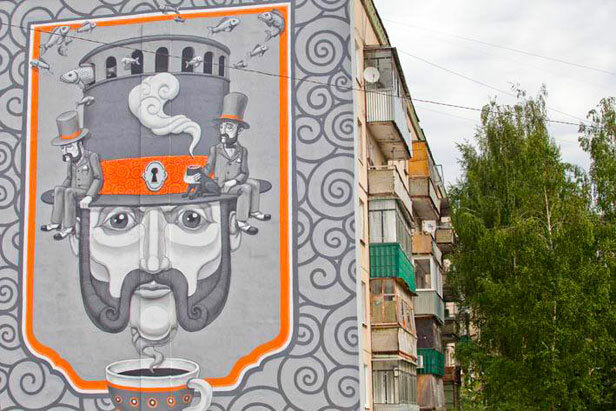 The Vyksa project is not unique in Russia because of the fact that it has allowed graffiti and other street art, but because it is the first time that artists have not been restricted to a "reservation", but on the contrary, they opened up the urban environment.